Gain control and visibility with Vertabase project management software. It is intuitive, enterprise software that's easy to use - for you and your whole team. Designed to give non-project management experts powerful tools to organize and improve their projects. Vertabase is a great, painless, alternative to MS Project or Microsoft Project Server. A more robust alternative to project collaboration tools like Basecamp. Import from MS Project, MS Excel and Google Spreadsheets. Exports to MS Outlook and Google Calendar. From a recent review: "Vertabase Pro is an excellent example of what project management software should be. Its highly customizable reports, well-thought out features and overall depth make it a comprehensive online project management tool." Its easy to set-up projects, create schedules and start managing projects using best of class project management tools -without the headache or formal training most project management software require. You can track resources, manage status updates, generate executive dashboards and control your project budgets. 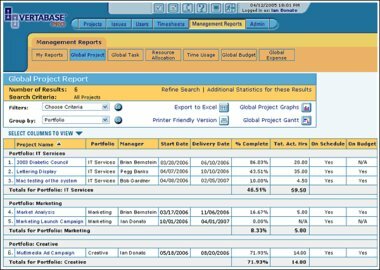 Cross project charts and portfolio reporting give you visibility into everything going on in your organization. The customizable interface means you can turn-off any feature you don't want to use and it will disappear from the interface -keeping users from getting distracted or overwhelmed. Keep everyone in the loop with automatic email notification and client views. The document and asset management section gives you powerful document management to keep track of all assets related to a project or task and to collaborate online. The issue tracker centralizes posts on projects and their solutions, in one, convenient knowledge base. The project management software generates Gantt chart, pie-charts and a host of reports which are fully printable and exportable to MS Excel and Adobe PDF. 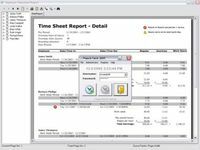 Export timesheets to Quickbooks for easy invoicing. If you like, import and export straight from MS Project.